The goddess Athena battles the giant Enceladus. The goddess is equipped with a shield, spear, helm and aegis cloak, and the giant a shield, spear, helm, greaves and breastplate. Although unlikely, the painting might instead depict Athena battling Ares in a scene from Homer's Iliad. 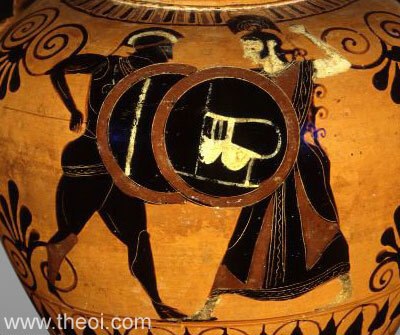 Ares and the giants are both depicted as generic hoplite warriors in Athenian black figure painting.